These charming Pave Heart Stud Earrings are made from sterling silver and Cubic Zirconia gemstones. The CZ stones shine as bright as diamonds, offering the perfect look for any style. They bring a nice perky lift to a casual outfit and are simple enough to go with any formal or semi-formal outfit. The CZ and the sterling silver play off each other well and the shine of the stones are magnified by the shiny nature of the silver. The small size of the earrings, at 9mm, keeps them from becoming overpowering and makes them a perfect addition to any woman's wardrobe. The Pave CZ Heart Stud Earrings in Sterling Silver is a beautiful piece and is comprised of 23 individual Cubic Zirconia pieces, each one cut to maximize color and quality. 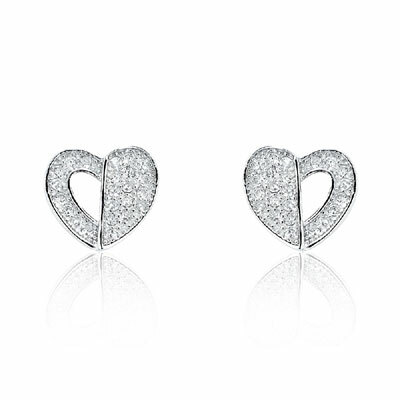 The unique and fun design of the Pave Heart Stud Earrings also makes them a popular item for any look you may be trying for. This one of a kind luxury jewelry design is sure to turn heads and take any outfit from drab to fab! We guarantee our Pave CZ Heart Stud Earrings in Sterling Silver to be high quality, authentic jewelry, as described above.